Encouraged by unexpectedly warm autumn weather I decided that activating this readily accessed summit was a good way to spend Sunday morning on 25th May. had confirmed the access and even provided a GPS track to load into my GPS62S. It was hardly necessary though it is interesting to look at the contour lines and levels as you walk along this path and up the hills. I left home at about 6:45 and arrived at the start of the walk at about 8 am. On the way up I counted six gates to negotiate, one of which had a chain latch to open but the rest had to be climbed over or through. They are multiplying as others mentioned five. Much of the pathway would be readily ridden on a bike. It might be just as well to leave the bike at the foot of the final ascent because it is steep enough to be difficult on the way down. 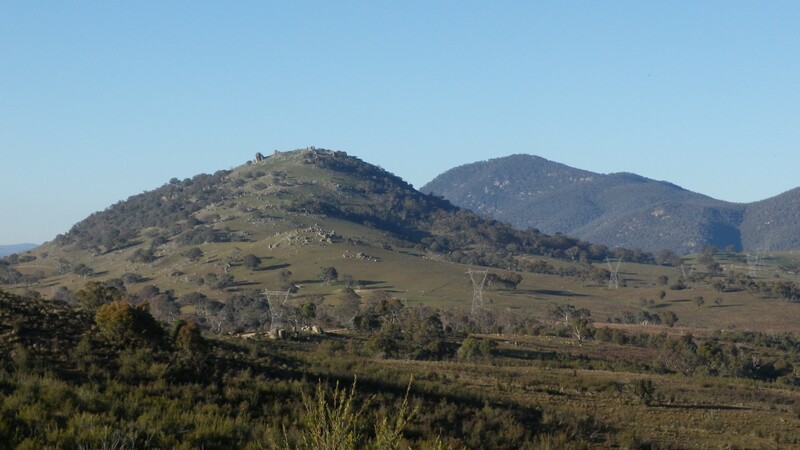 The photos taken by Andrew Moseley and Ian Sinclair show the route and the scenery. 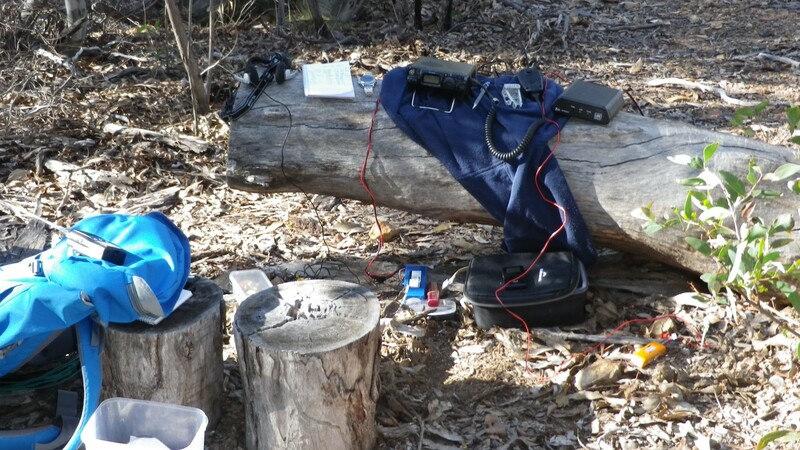 At the summit, the log and the stumps provide luxurious lounge room standard SOTA operating bench. For once I didn’t sit on the ground and fight off the ants, though I did get a mosquito bite from something that looked like it needed to file a flight plan before taking off. On the radio I put 48 contacts into the log, mainly on 7 MHz, but also on 146, 24, 28, 14 and 10 MHz. Two contacts come in for a special mention. One was on 10.12 MHz with Peter VK3YE/m on the beach, literally barefoot (*) in ankle deep water, carrying the radio and a loop antenna. Signals were up to s9 from Peter but in a very short time went down to inaudible. A VK5 was also on the frequency but conditions dropped out so quickly I didn’t have time to get a report from him. The second contact was incomplete because of battery problems at the other end. 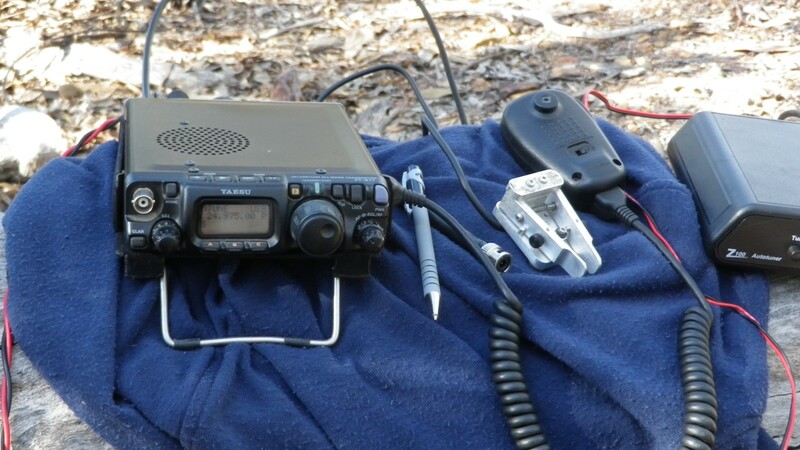 It was Paul VK1PAW who was using a recently built MST (Minimalist SSB Transmitter) on 20m. Unfortunately the battery problems prevented a contact being completed but I received an email from Paul explaining the problem. I really like the concept of the MST and want to build one myself. The power level of 5w is adequate for some remarkable contacts on 20m. I have proven that with the 817, working European stations several times, including some activators on summits themselves.